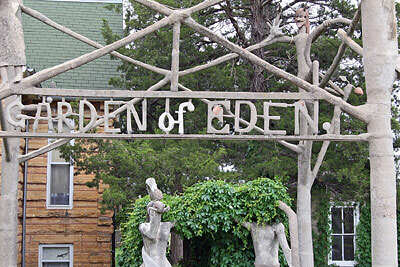 The Garden of Eden is a finalist for the 8 Wonders of Kansas because it is a world-renowned grassroots art site with one of the most fascinating (and bizarre) sculpture gardens in the world! In 1907, at the age of 62, Civil War veteran Samuel Perry Dinsmoor began construction of this unusual site by building a structure of limestone logs, (some up to 21 feet long) for the family home. 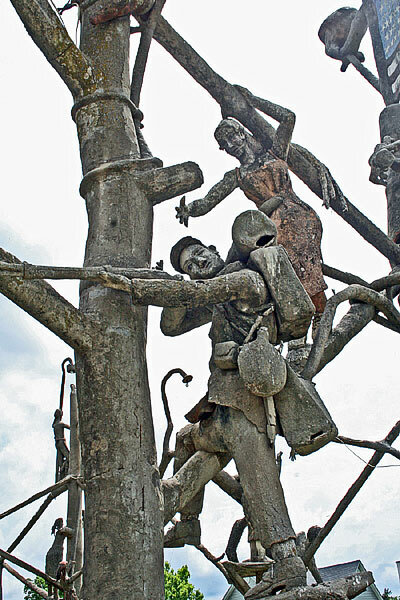 Then, using 113 tons of cement, Dinsmoor built 40-foot tall trees to hold his larger than life figures for his sculpture garden. He stopped working on the sculpture in 1929 because he went blind! Tour guides help an observer become fully aware that every part of every cryptic sculpture has meaning about Populist politics, modern civilization, and the Bible that connect like a dot-to-dot puzzle. The humor and message that he conveys through the sculptures amazes visitors. 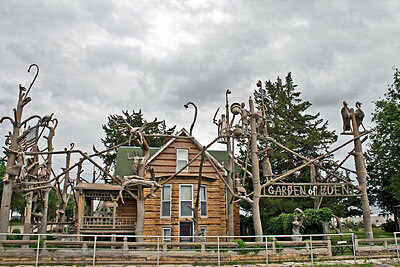 Visitors to Lucas should take time to visit other grassroots art attractions in town to understand the extent of the legacy left by one of Kansas' most eccentric artists. Start at the downtown Grassroots Arts Center that showcases other grassroots artists. Also find Eric Abraham's Ceramic Flying Pig Studio, Erika Nelson's World's Largest Souvenir Travel Plate, Florence Deebles Sculpture Rock Garden and Mri Pillar's 3D art of recycled products. Location: Kansas and 2nd, Lucas. Hours and admission charge: May-October, daily 10 a.m.-5 p.m.; November-February, Saturday-Sunday 1-4 p.m. Adults $6; children 6-12 $1.